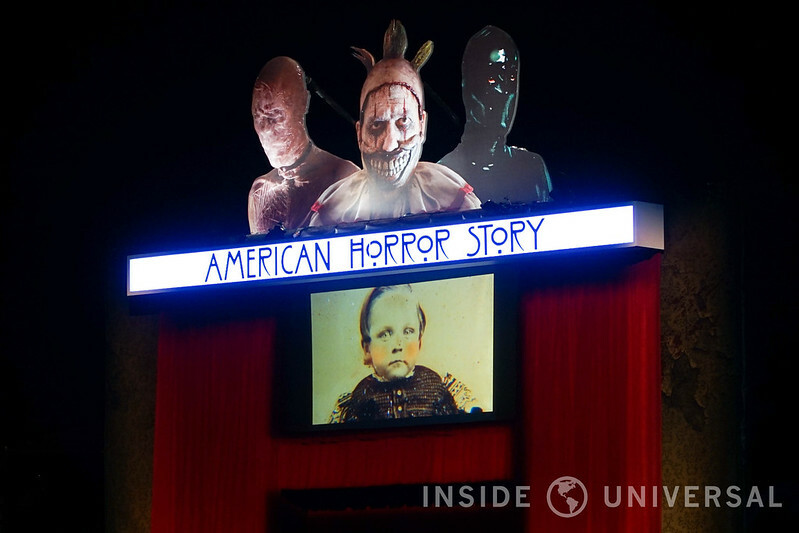 As one of this year’s most anticipated mazes, American Horror Story makes its debut at Halloween Horror Nights 2016 on Universal’s famed metropolitan sets. For those who are unaware of the popular television series, American Horror Story is a horror anthology on cable network FX, featuring original episodes without an overarching story arc alongside an ensemble cast. How could an anthology possibly translate into a functional maze at Halloween Horror Nights? Simple: like the show, the maze is divided into different seasons: Murder House, Freak Show, and Hotel. 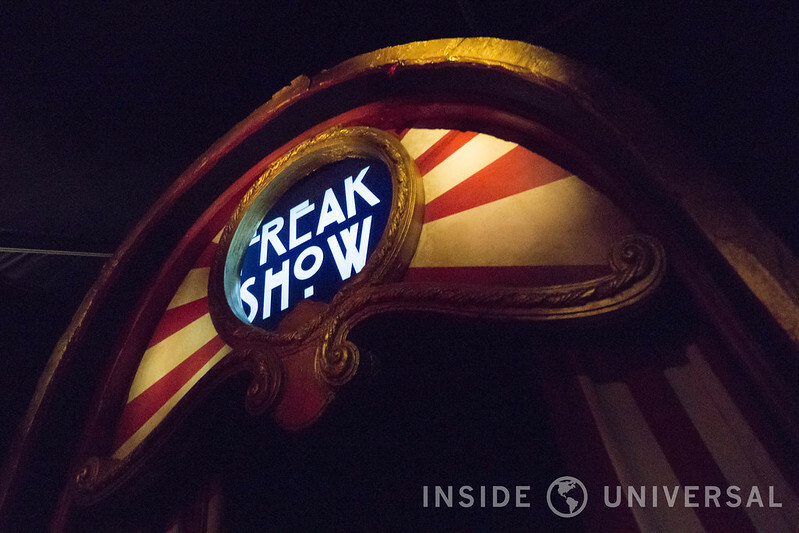 Each section is broken up by a archways, each featuring a projection of each season’s opening credits to help guests quickly and effectively figure out which story they’ll be transported into next. These portals prove to be a simple – yet effective – storytelling technique that ties an otherwise unrelated series of events into a one continuous walkthrough. Let’s begin with the show and maze’s first season: Murder House. Unaware that the house is haunted by a dark past, the Harmon family moves into the renovated mansion only to discover that their goal of finding peace won’t be found. As guests wind through the dilapidated mansion, they run into many fan favorites including Doctor Charles Montgomery, a physician who performed medical experiments on his patients, Larry Harvey, a former resident that in a trance that started a fire to murder his family, and of course the mysterious Rubber Man, who serves as the primary jump scare actor throughout this chapter of the maze. Like The Exorcist, American Horror Story’s initial scenes are large and elaborate. If there’s a common theme at this year’s event, it’s that Murdy and Williams have sacrificed scares in favor of creating atmospheres and featuring large, elaborate set pieces. 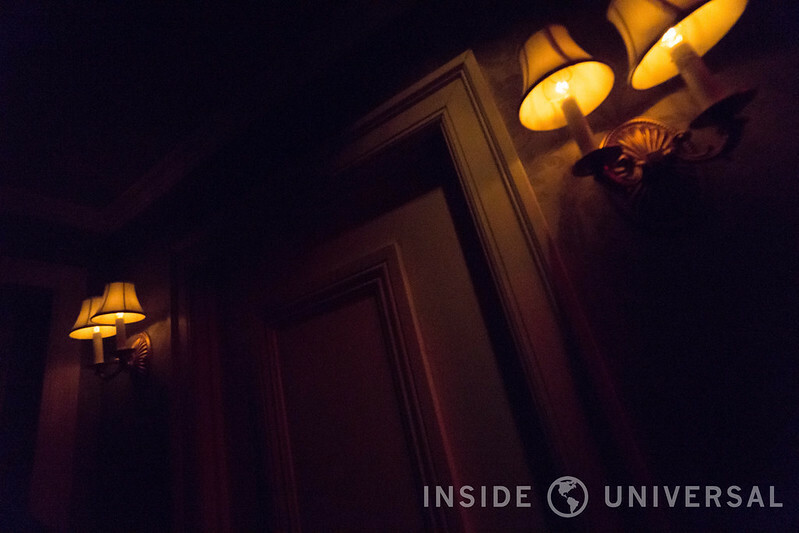 That’s not to say the event – and by extension, American Horror Story – aren’t scary, but it does mean that much of this walkthrough emphasizes guests taking in the imagery rather than anticipating the next jump-scare. 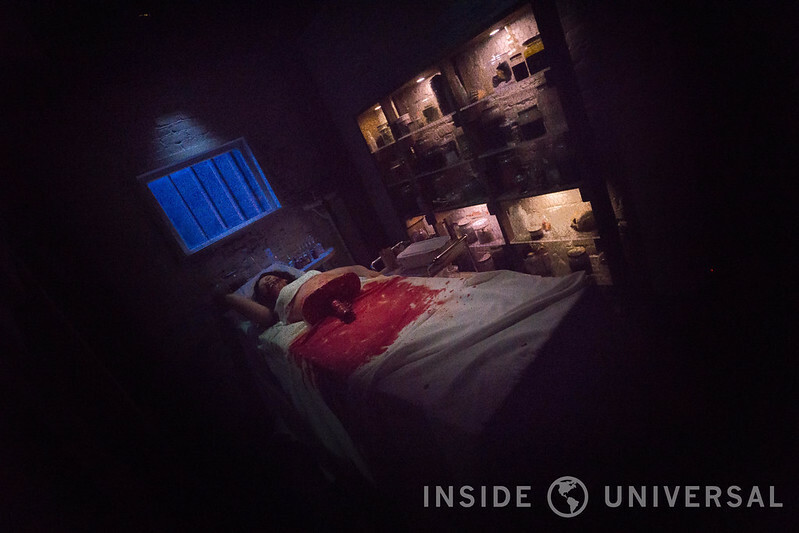 As an example, Adelaide Langdon’s pretty girl scene and operating table from The Black Dahlia aren’t scary per say (there aren’t any flash scenes), but their imagery is disturbing, setting the mood for the rest of the experience. Given how Halloween Horror Nights has been roundly criticized for featuring the same repetitive scare sequences, this is a welcome shift in focus. Next on our list is Freak Show. Set in Jupiter, Florida in 1952, the story follows one of the last remaining troupes of freak show performers that form a combative relationship with the general public. This section is perhaps the shortest section of the maze, but easily the most impressive. 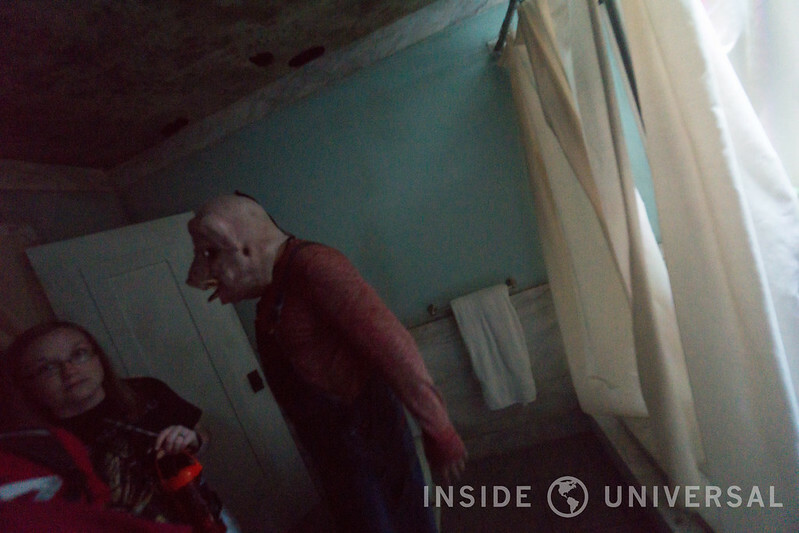 Guests will first find themselves in the forested lair of Twisty the Clown, a sadistic clown who – in the process of trying to commit suicide – blew his own mouth apart with a shotgun. 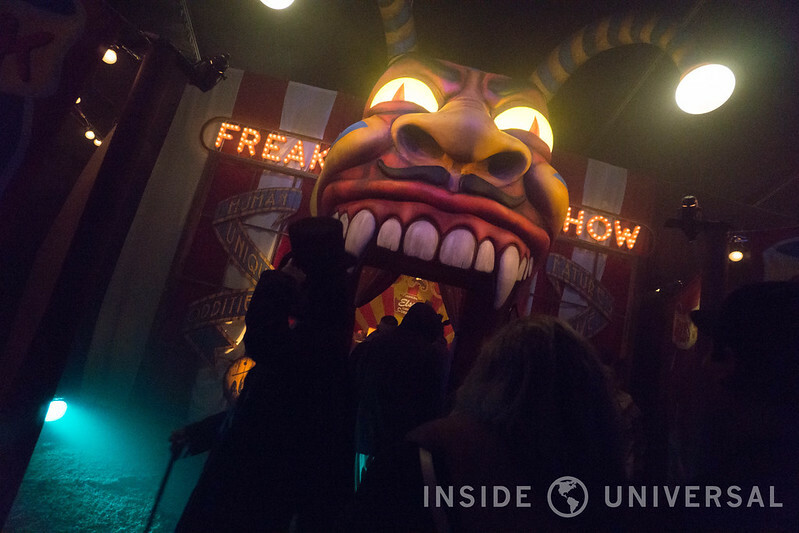 Once free from Twisty’s clutches, guests find themselves walking up to the to the freak show tent itself adorned with the classic posters showcasing each freak that lies within. 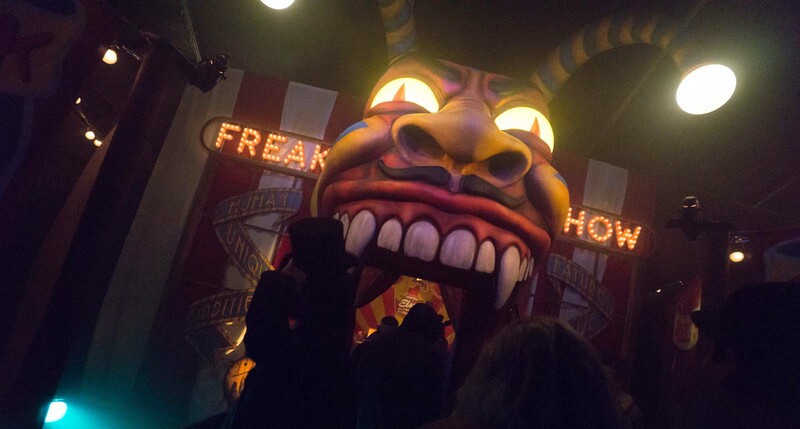 Reminiscent of the entrance for The Simpsons Ride, Freak Show features a large demon-esque mouth that serves as the entrance for the next scene. It’s large and foreboding, serving as the perfect transition into the demonic tales that lie within. Chris Williams’ emphasis on maintaining continuity between the television show and the maze is evident in this section, with banners advertising “human unique oddities” and “nature’s all alive wonders” adorning the side of the mouth just like they do on the television series, alongside prints taken from the show. 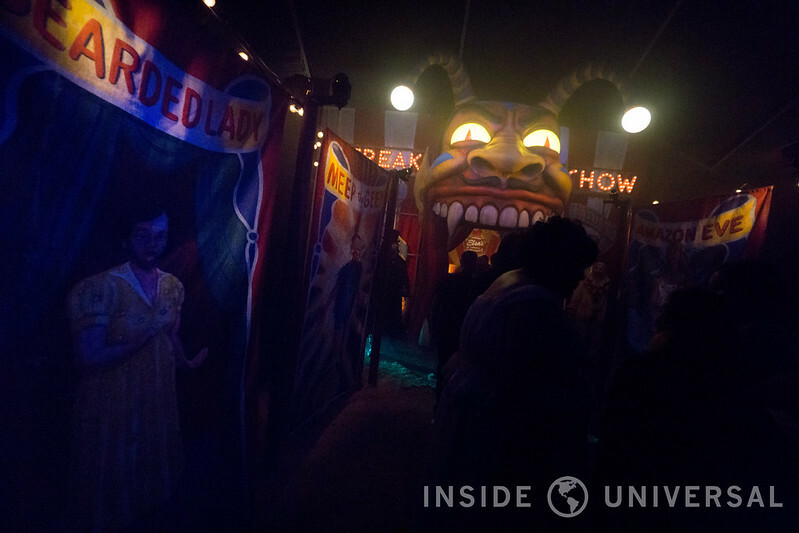 Even though you’re clearly within a tent the entire time, the Freak Show portion of the maze does a remarkable job of actually making you feel like you’re outside. A combination of lighting, crickets chirping, heavy use of foliage, and even the smell of pine trees really sell the idea that you are outdoors on a pleasant Florida night. With the small amount of space Murdy and Williams are given, it’s astonishing that they can accomplish such an amazing feat in such a confined area. Hotel – the maze’s final section – is perhaps the most detailed section of the three. Focusing namely on the infamous Hotel Cortez nestled within Los Angeles, the season features stories of gruesome murders, blood sucking vampires, and mysterious demons partly inspired by the real-life Hotel Cecil in downtown Los Angeles. The hotel itself was built in the 1920s as a giant torture playground for its ruthless serial killer owner, James Patrick March, who still haunts the hotel to this day. This section of the maze is almost entirely played out within the winding hallways and dead ends specifically built into The Cortez to confuse victims of the hotel, making it one of the more claustrophobic sections of the experience. Guests will also visit the March’s former office, the infamous room 64 (the site where he tortured the majority of his victims). The hidden chamber located behind the wardrobe is also present displaying the “trophies” March has collected from his ten commandments killing spree (which are replicated with amazing authenticity from the television show by Universal’s prop department). As the maze comes to an end, guests will confront Lady Gaga’s character The Countess who violently protects her disfigured baby from guests as blood dribbles down her mouth and onto her pristine white dress. Again, the casting and costuming is fantastic as there is no problem quickly figuring out whom you’re looking at any given time. Fans of the series will be in for a treat with this one. In short, American Horror Story could be one the highest rated mazes at this year’s event. A unique premise, coupled with impressive sets, several large rooms and a constant flow of references to the television series make American Horror Story one of this year’s strongest experiences. 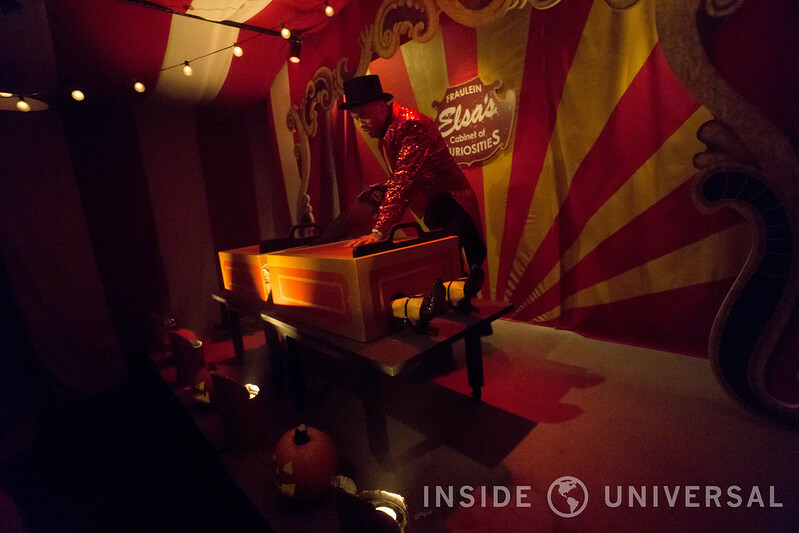 If you’re looking for a maze that sways away from the typical Halloween Horror Nights’ emphasis on boo-holes and flashes of bright light, look no further. 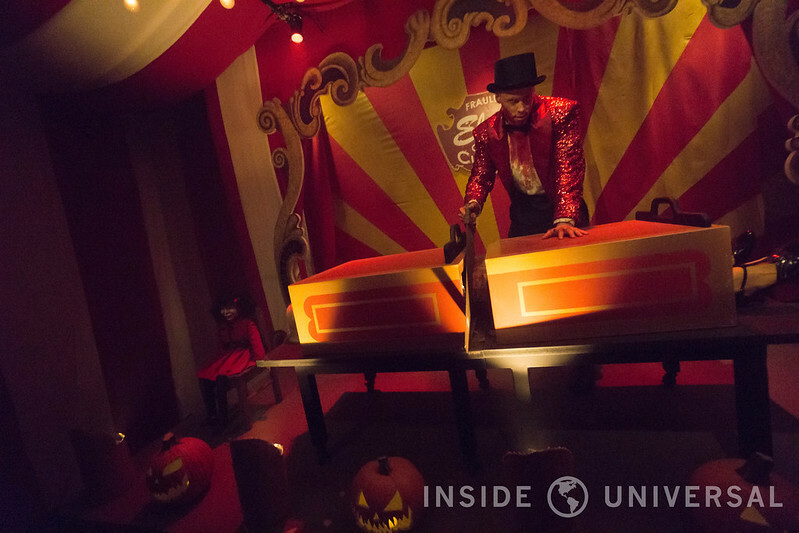 While not the scariest maze on this year’s lineup, American Horror Story certainly compensates by encapsulating this year’s emphasis on large set pieces and immersive environments – and boy, does it impress.